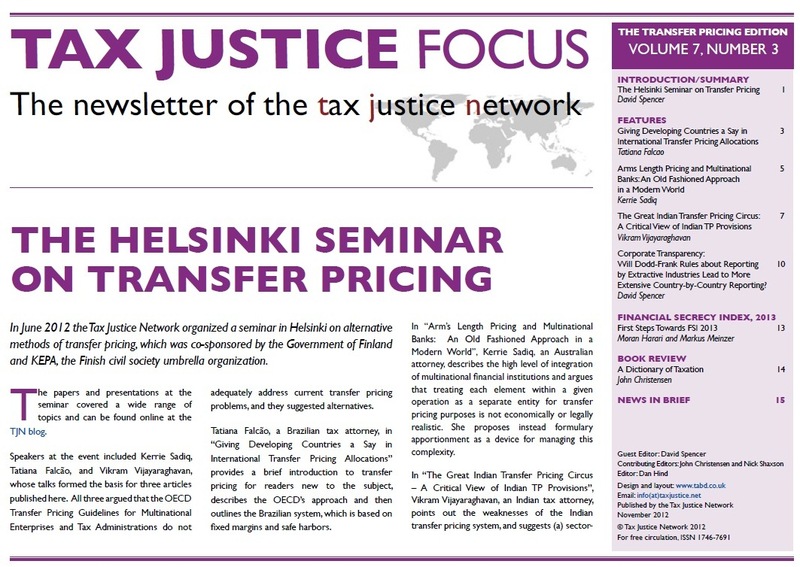 The latest edition of TJN's quarterly newsletter, Tax Justice Focus, is available for download here. In her article Brazilian tax attorney Tatiana Falcäo contrasts the Brazilian approach to transfer pricing, which is based on a mix of safe harbours and fixed margins, with the OECD approach based on the arm's length method. Australian attorney Kerrie Sadiq explains why the high level of integration and complexity of multinational financial institutions (MFIs) like banks allows massive opportunities for profits-shifting and proposes unitary taxation and formulary apportionment as the appropriate response for overcoming the problems that arise from trying to tax MFIs. In our third feature article, Indian tax attorney Vikram Vijayaraghavan explores the deficiencies of the Indian transfer pricing system and proposes the use of safe harbour arrangements, formulary apportionment, and a streamlining of current transfer pricing provisions. In his article, David Spencer, summarises the reporting requirements for resource extraction companies required by the Dodd-Frank legislation in the USA, and compares these new requirements with the broader reporting requirements that would be required by a full Country-by-Country reporting provision. TJN's Moran Harari and Markus Meinzer provide a progress report on preparations for the 2013 edition of the Financial Secrecy Index, scheduled for launch in November 2013. In his book review, John Christensen finds the new edition of A Dictionary of Taxation (Simon James, published by Edward Elgar, 2012) a helpful addition to his desk. Plus our usual summary of news items from recent months. 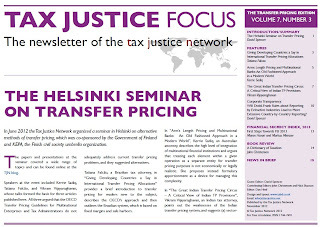 Download your free copy of Tax Justice Focus, volume 7, number 3 here, and feel free to circulate to colleagues and friends.